PRESS RELEASE: Inspired by an idea of Meinl artist and Shadows Fall Drummer Jason Bittner, Meinl is introducing a new 20" Heavy Bell Ride in their MB20 series of cymbals. 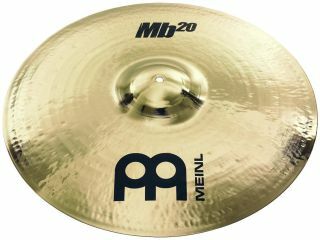 MB20 series are hand hammered cymbals targeted for the hard hitters playing extreme forms of Heavy Metal and Rock music. Due to the specially designed and extra heavy bell, the new ride offers enhanced projection and a dominant, full-bodied sound. It's sound is powerful and cuts through, yet always musical. The fact that it is made from B20 bronze alloy gives it a warm and dark sound character. This adds to the cymbals versatility so that it could also be used in other less extreme styles of music, like Rock or Pop. "I use the new MB20 Series Heavy Bell Ride as my left-side ride," explains Shadows Fall Drummer Jason Bittner. "It complements the sound of my MB10 Bell Blast Ride perfectly when I play two-handed ride patterns. The two different bronze alloys B10 and B20 make for a great combination within my setup."